The cloud — that's a powerful term these days. If you release a product that doesn't do something with the cloud, then you probably shouldn't even bother putting it out. Snack foods, floor cleaners, maid services and even consumer electronics like the newly-announced Xbox One use the cloud to do great and magical things. Like what, you ask? How about LIVING GAMES? I put that in all caps to stress how cool it sounds. "Living Games on The Cloud" might be the coolest-sounding feature ever typed. What does it mean? According to Microsoft, the Xbox One leverages the great and awesome power of the cloud so that games can evolve and learn from actual players. For instance, it could gather play data from one of your friends and create a shadow version of said friend you can play against. That's revolutionary right there. No longer will we have to play with our actual friends, with their smells and chatter. This new technology will make fake friends for us to play against. It's almost as exciting as it was when Real Racing 3 did it earlier this year on iOS and Android! THE CLOUD. See, even when I make it sound less impressive than it is, it's still pretty impressive. The Xbox One will also use the cloud to somehow create dynamic, living worlds that evolve the more you play, something impossible without clouds. Also, your games will be able to keep up with current happenings. They say that real-world events can instantly be added to your games, such as sports stats or weather forecasts. That last one is actually a neat idea. I've long craved a game that could take my local weather and reflect it in the game world. Thanks, the cloud! Here are some of the bullet points about the benefits of cloud connectivity Microsoft has offered up. 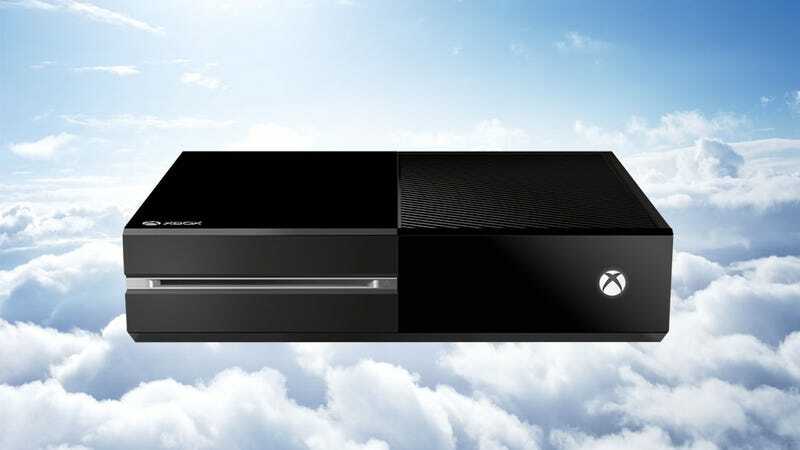 Your games and entertainment are stored and saved in the cloud, so you can access them anytime, from any Xbox One. "Dammit, Dale, do I have to go to Mom's funeral? I'm in the middle of an episode of Supernatural. Oh, there's an Xbox One there? On my way."